Sam Young is waiting to find out whether he will be excommunicated from The Church of Jesus Christ of Latter-day Saints for advocating an end to youth worthiness interviews, typically one-on-one discussions between an adult male church leader and children that include questions of sexual activity. After a 90-minute disciplinary council in Houston on Sunday, Young said he was left without a final decision on his membership status but that he remains convinced that he will soon be removed from the church. Young, a former Latter-day Saint bishop, said he considers himself an active, believing Mormon. He said he asked that he be allowed to remain a member of the Utah-based church but was accused by his regional leaders of opposing, and encouraging other members to oppose, the faith’s governance. The hearing, which lasted from 6 p.m. to roughly 7:30 p.m. Central Daylight Time, included 15 minutes of accusations against him, Young said, followed by a 10-minute response by Young’s wife, a 30-minute response by Young, and 30 minutes of questions from members of the stake high council — a group of lay leaders over a regional cluster of Latter-day Saint congregations. Those questions included whether Young believes the church to be the true and restored gospel of Jesus Christ, why Young desires to remain a member and Young’s evaluation of “For the Strength of Youth,” a church-produced handbook on appropriate dress, behavior and sexual activity for Mormon teens. Eric Hawkins, a church spokesman, declined to comment for this article. Instead, the spokesman reissued a statement provided to The Tribune in advance of Young’s disciplinary council. Young shared his prepared remarks for the closed-door disciplinary council with The Tribune. In those remarks, he emphasizes that Mormonism is unique in its practice of youth worthiness interviews, which are not described or mandated in any of the church’s canon of scriptural texts. Young’s remarks also included 29 questions asked of church members by their bishops, according to personal testimonials collected by Young. The questions are explicit, with lay leaders having allegedly pressed youths for details of their wardrobe, physical responses and enjoyment levels during sexual activity. As part of his campaign, Young organized a march in Salt Lake City and recently conducted a 23-day hunger strike near church headquarters. 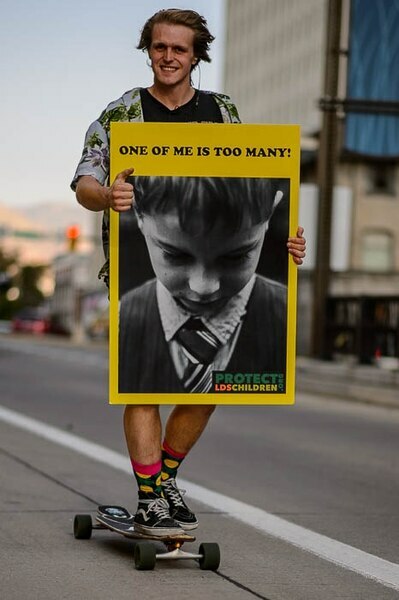 He formed Protect LDS Children and gathered tens of thousands of online signatures in support of his cause. He has also advocated for changes on his personal blog — which Young said was the primary source of evidence against him during the hearing, along with coverage of his efforts by the church-owned Deseret News — and in LDS-themed podcasts and publications. The church responded in March by updating its policies on youth worthiness interviews, adding the option of an interviewee to have another adult present. Church leaders have also stated that bishops are taught to ask only if a member is obeying the “law of chastity” — a morality code that prohibits premarital sexual activity — and to avoid graphic detail during worthiness interviews. 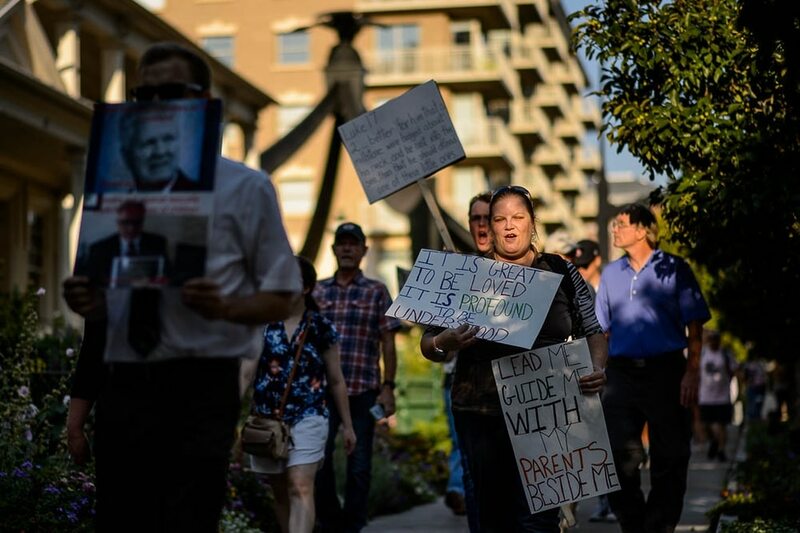 On Sunday, supporters of Young gathered outside the Houston meetinghouse where his hearing was held — and in Salt Lake City and other locations in the intermountain West — according to firsthand accounts posted on social media and the Exmormon subreddit Web page. 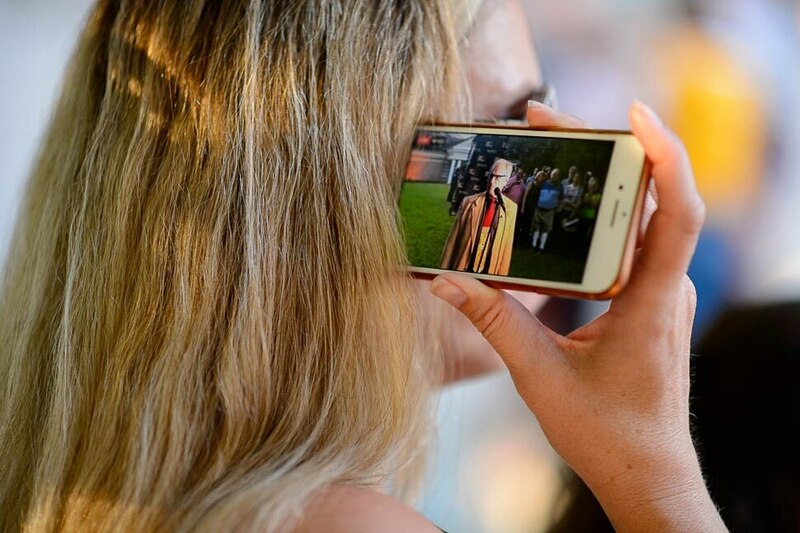 (Trent Nelson | The Salt Lake Tribune) A woman listens as Sam Young speaks on a livestream after his hearing. People gathered in front of the LDS Church Administration Building Salt Lake City, Sunday Sept. 9, 2018 in support of Sam Young. Young was in a disciplinary hearing tonight after he made calls for changes to the church's youth interview process. (Trent Nelson | The Salt Lake Tribune) People gathered in front of the LDS Church Administration Building Salt Lake City, Sunday Sept. 9, 2018 in support of Sam Young. Young was in a disciplinary hearing tonight after he made calls for changes to the church's youth interview process. (Trent Nelson | The Salt Lake Tribune) People gathered in front of the LDS Church Administration Building Salt Lake City, Sunday Sept. 9, 2018 in support of Sam Young. Young was in a disciplinary hearing tonight after he made calls for changes to the church's youth interview process. (Trent Nelson | The Salt Lake Tribune) People gathered in front of the LDS Church Administration Building Salt Lake City, Sunday Sept. 9, 2018 in support of Sam Young. Young was in a disciplinary hearing tonight after he made calls for changes to the church's youth interview process. (Trent Nelson | The Salt Lake Tribune) Michelle and Steve Boyer watch Sam Young speak on a livestream after his hearing. People gathered in front of the LDS Church Administration Building Salt Lake City, Sunday Sept. 9, 2018 in support of Sam Young. Young was in a disciplinary hearing tonight after he made calls for changes to the church's youth interview process. (Trent Nelson | The Salt Lake Tribune) People gathered in front of the LDS Church Administration Building Salt Lake City, Sunday Sept. 9, 2018 in support of Sam Young. Young was in a disciplinary hearing tonight after he made calls for changes to the church's youth interview process. (Trent Nelson | The Salt Lake Tribune) People watch as Sam Young speaks on a livestream after his hearing. People gathered in front of the LDS Church Administration Building Salt Lake City, Sunday Sept. 9, 2018 in support of Sam Young. Young was in a disciplinary hearing tonight after he made calls for changes to the church's youth interview process. Young said he was not given a timeline for when a decision will be made regarding his membership status. He said the meetinghouse appeared to be empty roughly 10 minutes after he left the room, suggesting either brief deliberations by the council or ongoing deliberations at a later time. The experience of the disciplinary council, he said, does not change his outlook on the nature or need for his advocacy. While he said he expects excommunication — the most severe punishment within the church — he added that he hopes to be able to remain a practicing member of the faith. “Excommunicating me does not do the church any favors. It doesn’t shut me up,” he said. “I think they want to send a message — ‘Do not questions us.'" Young said he has no plans at this time for future events or demonstrations. After a significant time in Salt Lake City, Young said, he plans to focus on his family and business in the short term.